Original beer bottle label, circa 1905-1918, from the John Hajicek Library/Archives. My great-great grandparents and their children. My great-grandfather John Hajicek, whom I knew, is the second from the right. There is nothing on earth more important than church and family. I posted this so that my children would know something about their ancestors, but it has also introduced me to distant cousins around the world. I welcome comments, additional details, and new friendships with kin. Knowing our origins and relations gives us a sense of place in the world. I have two beautiful daughters, Jessica Danielle (born July 22, 1991) and Samantha Renee (born September 1, 1993); and a handsome son, Jacob John (born February 25, 1997). Since June 2002, I have had legal residential custody of my children, except 2/3 of weekends, 2/3 of holidays, and 2-3 weeks of vacation per year. My parents are James and Diane Hajicek of Burlington, Wisconsin, happily married since 1960. My father was an engineer and had a consulting firm until he died in March 2007. My mother is a devoted homemaker and was a help to my father. I talked about my parents in My Personal History post and also at my bookmarked Hajicek (father) and Bromen (mother) paragraphs below. My family was mostly from Eastern Europe, mostly Catholic, mostly came to America recently (late 1800s), and mostly settled in the north or Minnesota. Imagine Laura Ingalls Wilders Little House on the Prairie, and you will know everything about the lives of my ancestors who were pioneers in that same setting of western Minnesotaexcept that they spoke Czech and German, and drank beer. My name is Czech, but my ancestors also came from the contiguous countries of France, Switzerland, Luxembourg, and Germany, as well as the Czech Republic. I figured out that I am 10/16 German, 2/16 Czech (Bohemian), 2/16 French (shifting border with Germany), 1/16 Luxembourgian, and 1/16 Jewish (German), and a trace of Swiss (German), and the German includes Prussian and Bavarian. My Hajicek ancestors lived in the same hamlets near Doubravka, Czech Republic, for at least 450 years and likely 1,100 years. Jessica, Samantha, and Jacob are 11/32 German, 6/32 English, 5/32 Irish, 3/32 French (mixed with German), 2/32 Czech, 2/32 Dutch, 2/32 Luxembourg, and 1/32 Jewish (German), with a mixture of others including Swiss, Prussian, Bavarian, and perhaps some Norwegian and Native American. Their other ancestry contrasts with mine, as it is mostly from the British Empire, mostly Protestant, mostly came to America early (1600s), and mostly settled in Pennsylvania, Ohio, and the south central states including Kentucky, Tennessee, Alabama, Texas, Oklahoma, and Missouri. They have an American heritage going back 400 years. They have a Revolutionary War heritage. They have a California heritage. They have a heritage in the Latter Day Saints movement going back 150 years. They have a heritage in the same town in which we are now building a house, for over 100 years. Hαjνček is a surname from a small wooded area in South Bohemia. Bohemia is now in the Czech Republic, and was part of former Czechoslovakia. Hαjν is an archaic Czech word for forest. Hαjνek is a little forest. Hαjνček is a very cute little forest. Each is successively more diminutive. Either Haj or Hαjνek can now be a wood, grove, or even gardenbut always like a smaller forest. Hαjνček, though, is a cuter or an endearing version of the word, denoting an emotional relation. Lovers meet there, as a park in which to tryst. In folk songs about lovers and their dates, Hαjνček is frequently used. Hαjνček is correctly pronounced Hah-ye-check (rhymes with Czech). Many family members now skip the middle syllable, like Hi-check. Because Hαjνček translates roughly into Grove or Woods from the Czech language, some of us have changed our names to either of those, or used them in business. I welcome Czech scholars to help me continue to refine this paragraph as I have for 20 years. The next paragraph is all new, and I particularly hope that some experts in archaic Czech etymology will refine my place name translations. Our Hajicek family heritage is entirely from the same Czech (Bohemian) cluster of oak wood villages called Doubravka, Doubrava, Paovice, Koloměřice, and Hosty, all within a three miles area. These family-sized villages surround a particularly small but distinctive forest which the Vltava River gently wraps around just north of the historic town Tύn nad Vltavou on its way to Prague. The five villages are in the township of Tύn nad Vltavou 1, in district of Českι Budějovice, in the region Jihočeskύ Kraj (South Bohemia region). Our grove, not part of the boundary forest area of the Bohemian Forest from which it is differentiated, is 55 miles from Prague and 155 miles from Vienna. Tύn means a foundational town surrounded by a fence, and Tύn nad Vltavou means such a town on the Vltava River, fitting because it was a town of Prague bishops castles dating back one thousand years where the little forest families doubtlessly fled when their towns were burned and plundered. The Hajiceks were evidently settled in this area for between 800 and 1,100 years, and historically by Hajicek name for 450 years. They probably took their farm produce to market in Tύn nad Vltavou where one might have been known as John from the Family in the Little Woods, which in Czech language would have been Jan Hαjνček. I surmise that the place name Doubrava means oak woodland, Doubravka means oak wood forest, Paovice means it was a place of river smugglers, Hosty means a place of a tavern or probably a brewery, and Koloměřice was a measuring wheel, perhaps a commercial center along the road. Doubrava nad Vltavou means this oak wood village was on the river, and Doubravka u Tύn nad Vltavou means that this other oak wood forest village was near that larger river town, and that is how the names of those two towns were usually expressed. Jeri Hajicek was born nearly 450 years ago, about 1560 in the village of Koloměřice, house #5. All Hajicek family members from Doubravka are said to be his line, the earliest documented but certainly not the first Hajicek to live in Koloměřice. In Doubravka, my branch can supposedly be traced back at least 350+ years to 1655. An unreliable source says that the earliest traceable Hajicek in Doubravka is Jakub Hajicek, the same as the name of my own son. I found an Adalberti (born about 1700 in Doubravka) with a spouse Johanna born in Tύn nad Vltavou. In the early 1800s, there were at least two families of Hajiceks in Doubravka, in house #1 and house #13. Jan (John) Hajicek was a farmer living in Doubravka house #1 from 1804 to 1885. My great-great-great grandfathers name was also Jan (John) Hajicek, and he was reportedly born in house #1 on July 27, 1823, the son of Tomas Hajicek and Anna Tebera, but later lived married in house #19. About this time, another Hajicek is known to be living in house #28. Perhaps all of the houses in these four grove towns were Hajiceks. I have an unreliable source that claims that there were Jan Hajicek births in Doubravka on December 27, 1820; June 6, 1822; and June 18, 1823. In any case, there was a Tomas born in 1792 at Doubravka #1, which is still said to be the nicest house in Doubravka. Tomas (1792) and Jan (1804) were sons of Matej Hajicek and Rosalie Matejka, she being from the grove village of Hosty, and married to him on October 13, 1782 at Doubravka. Mary Magdalene Tomek was born about 1730 in Hosty and married a Jan Hajicek in Doubravka #23. An unconfirmed source says they were married on October 13, 1872 at Doubravka, her father was Bartolomej Matejka, and she died in house #1, Doubravka. Their son, Jan (John) Hajicek (this source says was born 1813), is said to have married Rosalie Hajicek, the daughter of Vaclav Hajicek and Barbora Zahradka; but I also found a source that Jan (John) Hajicek (one born 1813) was married to an Anna (born 1817), so this all gets increasingly sketchy the farther that it goes back. My ancestor Jan or John (the one born 1823) married Mary Syrovatka, the daughter of Joseph Syrovatka and Vera Svoboda. The old registers are in the Regional Archives in Trebon, and I hope to research in them someday. The Hajiceks were members of the Catholic church. If I have this right, then, my lineage is Jacob (my son), John (myself), James Donald (1939), Donald John (1920), John (1891), Joseph (1862), John (1823), Tomas (1792), Matej (circa 1770), Unknown (circa 1750), Unknown (circa 1725), probably Adalberti (1700), Unknown (circa 1675), Unknown (documented 1655), Unknown (circa 1630), Unknown (circa 1605), Unknown (circa 1580), probably Jeri (1560). I am sure that people out there reading this can fill in some blanks and confirm my other information and trace my heritage back to a king or at least a nobleman. Everyone has an important ancestor if you go back far enough. According to my great-grandparents, who I sometimes visited by jumping on the city bus in Minneapolis as a child doing my genealogy, John Hajicek was born in 1823 and emigrated to Chicago in about 1865. My great-great-grandfather, Joseph Hajicek (born in Doubrava, I think my great-grandparents told me, evidently not adjacent Doubravka, on March 18, 1862), made their way to Chicago with other relatives following. From Chicago, the son Joseph moved on to the Czech immigrant farming towns of western Minnesota, where he was joined by his parents and he became a large landowner. 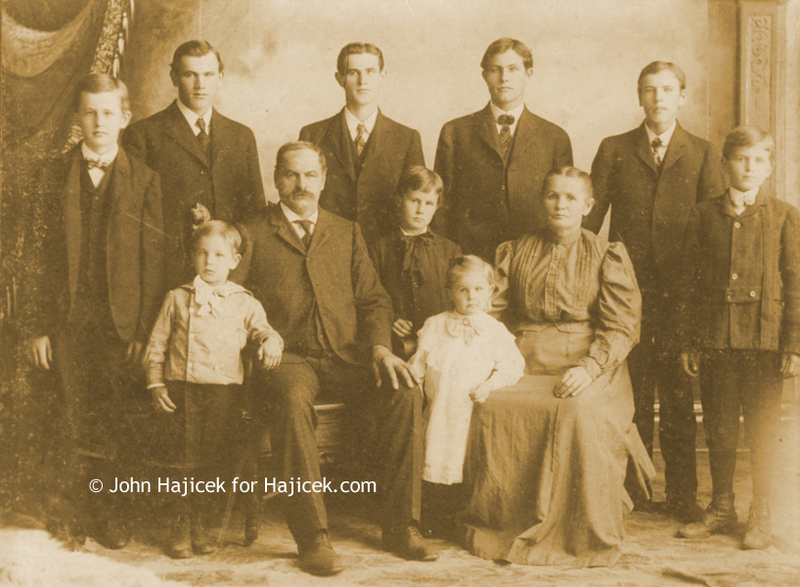 I have not done the sibling genealogy, but Hajiceks in this John Hajicek line continued to emigrate from Bohemia to Chicago into the 1900s: brothers and nephews, and then their brothers and nephews. Two-thirds of the family remained in Chicago; one-third of random members moved on from Chicago to Minnesota, some to St. Paul and at least Joseph to New Prague; and eventually a fraction from Joseph continued northwest to North Dakota. So the states with greatest number of Hajicek surnames today are Illinois, Minnesota, and North Dakota in succession; and all Hajiceks in America seem to be from this line, all coming from Doubravka, Bohemia or at least within a mile or two. Given names were repeated in the family among nephews and grandsons. If you are descended from a John Hajicek, a Joseph Hajicek, or a Frank Hajicek; or if you were descended from a Hajicek in Chicago, St. Paul, Hutchinson, or North Dakota; you are related to me somehow. In 1929, the year of the Wall Street Crash, the Hajiceks in Chicago were signing national currency for the United States Treasury. Joseph married Anastasia Kajer (born in New Prague, Minnesota, on the Mathias Kajer farmstead on April 16, 1860, the same one where some Kajers still live according to relatives in contact with me). Anastasia was born just before the Great Sioux Uprising or Dakota Conflict. (In 1862, with much of America consumed by the Civil War, fierce fighting erupted in Minnesota between Dakota Indians and white European settlers. By years end, hundreds of settlers and Dakotas were dead. Many settlers had fled Minnesota forever, and thousands of Dakotas were in prison or exile.) Anastasias parents were Mathias or Michael Kajer (Matej Kajer, born November 8, 1819, but aged 40 in July 1860 census but 53 in July 1870 census) and Maria Anna (Mary) Vancura or Voncira (born in Bohemia 1819-1825, aged 35 in July 1860 census but 50 in July 1870 census). The parents of Mathias were Paul and Theresa Kajer. The parents of Mary Vancura were Jacob Vancura and Maria Anna Fuxa in Bohemia. The Kajers first turn up in the small village of Mirovicku and in the villages of Mysline and Mirovice. These villages are in what was the Kingdom of Orlicke south of Prague. There are apparently two remaining cottages, and a brewery, where the family lived. Mathias came to America as a young man, worked on the railroad in Cleveland, moved to Kentucky, and then Dubuque, Iowa, where he was again constructing railroads. He married Mary Vancura in 1855, moved to New Prague, Minnesota, in 1856. There they farmed and were particularly active Catholics. Mathias homesteaded 2.5 miles south of New Prague in Lanesburgh Township, claiming 160 acres with a corner stake and a hut before retrieving his wife from Iowa. A 77-year-old Mary Kajer, identified as a housekeeper from Bohemia, was living with the family in the 1870 census. Matej and his wife Mary both died in 1899, Matej in March and Mary in December. The Czech name Kajer rhymed with higher and is often spelled Kauer elsewhere in America. The misspelling for this branch of Kajer in America family evolve from Keier (1855 marriage certificate), Gyer (1860 census), Gier (1867 tax receipts), Geyer (1871-72 tax receipts), and Kayer (1870 census), until the name was finally corrected back to the Czech spelling Kajer (1881 tax receipts, and 1884 cemetery plot receipt, and 1900 mortgage receipt). Even the history of Le Seuer County gives the name Matej Kajer as Michael Gayer. 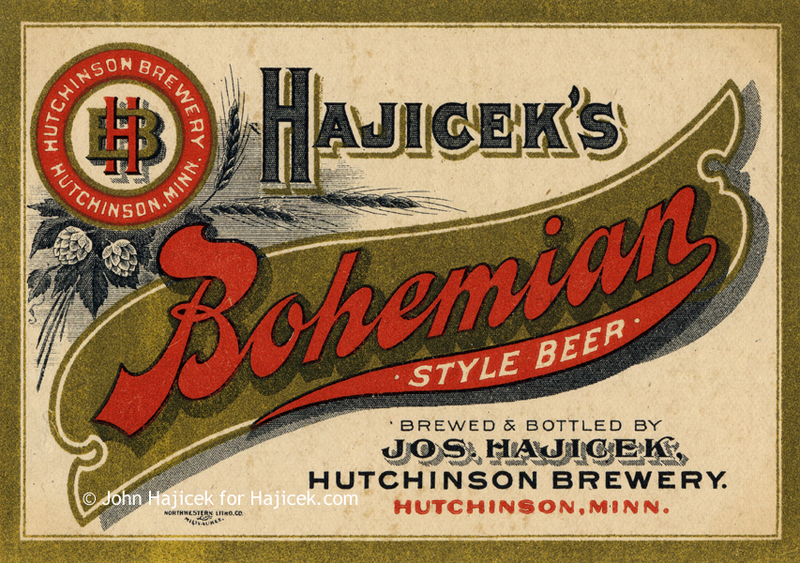 Joseph Hajicek was said to be devotedly attached to his wife and children who loved him as a kind and indulgent husband and father, ever ready to sacrifice for their comfort and welfare. Joseph Hajicek bought the 1870 Hutchinson Brewery (Hutchinson, Minnesota) and it was run under the the trade name in Joseph Hajicek Brewing Co. from 1905 to 1920 to make Hajiceks Bohemian Style Beer. The purchase price was $14,500, or the family farm of 320 acres. Family legend says that even after sending one son to brewery school in St. Louis, the Czech beer was so imperfect that he had to hire a German-born brew-master, John Hoerner (born in Germany in 1867). John Hoerners daughter, Eleanor Mary Hoerner (born July 10, 1899 at Little Falls, Minnesota) married Joseph Hajiceks son John Hajicek (born December 25, 1891 on the Hajicek farm in New Prague, Minnesota). They are my great-grandparents, and I knew them well growing up in Minneapolis. Eleanors mother was Clara Krahl (born in 1875 in Sleepy Eye or New Ulm, Minnesota). Claras parents were Nicholas Krahl and Theresa Reidel and they came over from Germany together. The death of Joseph Hajicek in 1914, Prohibition in 1919, and the invention of the automobile, brought my family out of the beer industry before the 1920s, and into the manufacture of rubber automobile parts (1918). John Hajiceks brother was Stanley T. Hajicek, who studied law at the University of Minnesota and then earned his Ph.D. in Economics at the University of Chicago, before teaching at DePaul. John Hajicek founded the Hutchinson Rubber Company and Twin City Rubber Works, making inner tubes, flyswatters, and military part. His son Donald John Hajicek (born July 7, 1920 at Hutchinson, Minnesota) founded Metro Moulded Parts to make replacement automobile parts, that still moulds rubber in Minnesota after 90 years of family rubber experience. He was previously a free-lance commercial artist. Donald John Hajicek was my grandfather, and the business remains in the family. Metro Moulded Manufacturing now makes specialty rubber products. My paternal grandmother was Elsie L. Leddin (born November 4, 1917 in Belmont, North Dakota), a restaurant owner and seamstress. According to her family Bible and family records which I have examined, and his WWI draft registration card, her father was Albert Leddin, born on May 23, 1874 in Alsace-Lorraine, then (High) Germany. But his father was William LaDean of Alsace-Lorraine that was before and now is again France. Albert Leddins mother was Emilia Miller. Elsies mother was Elizabeth Lizzie Sarah Rogahn (born November 13, 1892 in Tintah, Minnesota to a 62-year-old father), whose parents were from (Low) Germany. Albert and Elizabeth Leddin were purportedly early land developers in Coral Gables, Florida in about 1920, then they moved to Alabama in about 1925, and finally they returned to Minnesota in 1929. Elsies maternal grandparents were Herman Karl Rogahn (born March 26, 1831 in Germany) and Johanna Louisa Dorothea Klugmann (born June 10, 1857 in Germany). That is a 26 year age difference. Folklore says Johanna Klugmann was Jewish and she met Karl Rogahn who was German, and together they eloped as stowaways to America. This led my grandmother to declare herself Jewish late in life. However, my own research demonstrates that Carl Rogahn, with a c, arrived in New York together as registered passengers from Prussia (Germany) on July 27, 1891, by way of Hamburg, Germany, and Le Havre, France (census records indicate them both from Germany). He was 59, and he had a listed wife Joh who was 33, which was again 26 years younger than her husband. What is more, is that they had five children, the oldest of which was nine, so they had married perhaps 10 years. A family Bible, a German and Lutheran edition printed in 1879, also lists the births of six children, beginning in 1881. They could hardly have eloped as stowaways. The only part of the story that sounds credible is that in the 1910 census Johanna had changed her name back to Hannaka, and Hannaka Klugmann is a distinctive Jewish name. In 1900, another Klugman (one n) was living next door. In the April 1910 census, the age of Carl Rogahn increased to 80 (two years older than his immigration age indicates and one year older than his birth month and year indicates as confirmed in the 1900 census), if I did my math correctly. My father, James D. Hajicek (born July 13, 1939 at Fergus Falls, Minnesota) was the last holdout stockholder in his fathers company, Metro Moulded Parts, however he also was a graduate fellow and doctoral candidate in theoretical physics at the University of Minnesota. He ran his own company called Grove Rubber in Minneapolis, and then his own computer consulting firm named Voree Software in Burlington, Wisconsin, until his very unexpected death in 2007. As an engineer, he had designed computers for Univac, 3M, General Electric, and Eaton. In the 1960s, our family was one of the first households in America that had a mainframe computer in their home. My fathers brother Douglas runs Metro Moulded Parts now, and he also produces movies (including several on the Discovery Channel) on natural history, fishing, and wildlife. My fathers brother Robert is a computer programmer in St. Louis, Missouri, and owns his own firm. My sister Michelle is a computer programming consultant in Minneapolis, and Realtor (she graduated from the University of Minnesota) and holds an office for Mensa. She has a teenage son, Patrick, adored by and friends of my own children. My brother Allen Hajicek or Allen Woods is a highly successful commercial artist, Realtor, and real estate investor in Minneapolis. I was always proud of him for being the Minneapolis city chess champion (one of many things that he was better at than me, including anything artistic, mechanical, industrial, requiring concentration, or requiring coordination such as hockey or other team and performing sports). He is intensely spiritual and ethical. He has two beloved and missed teenage children, Joseph Hajicek and Caitlin Hajicek, who I love in their absence. My sister Sharon also has a real estate connection. She is a principal in a professional consulting firm that provides real estate development research. She has a masters degree in geography and urban planning from Miami University in Oxford, Ohio. She lives in East Lansing, Michigan. I mention some of these careers because of the interesting repetition and parallels through the generations. My mother, Diane V. Bromen (born March 16, 1942 in Sauk Centre, Minnesota) is extremely bright and self-reliant. She chose to raise a family, while all four of her brothers enlisted in the U.S. Navy or Coast Guard, two of them made Full Commander, and all of them became successful. All five are still married to five loving spouses. One brother, Roger Bromen (my uncle), now is the Chief Operating Officer for Tessada and Associates, an elite consulting firm in Washington, D.C. My maternal grandparents were Raymond C. Bromen (born August 19, 1913 in Sauk Centre, Minnesota) and Rose A. Otte (born November 11, 1915 in Melrose, Minnesota). The Bromens shortened their name from Bromenschenkel, or Prommenschenkel. The Bromenschenkels were members of the Catholic church and farmers. My great-grandfather was Nicholas J. Bromenschenkel (born in June 27, 1884 in Sauk Centre, Minnesota), a farmer, and his parents were John Bromenschenkel (born January 12, 1853 in Consdorf, Luxembourg) and Barbara E. Marthaler (born September 19, 1862 in St. Cloud, Minnesota). John Bromenschenkels parents were Nicholas Bromenschenkel (born October 17, 1812 in Consdorf, Luxembourg) and Margaret Müller (born September 3, 1822 in Consdorf, Luxembourg). The Bromenschenkels immigrated to Minnesota from Luxembourg in 1857. The Bromens were farmers and gardeners in Minnesota and Luxembourg. According to relatives who visited Luxembourg and wrote to me, Nicholas was the son of Bernard Prommenschenkel (born October 12, 1776 in Rippig, Luxembourg), the grandson of Michel Prommenschenkel (born 1745 or 1759 in Stegen, Luxembourg), and the great-grandson of Joannus Prommenschenkel (born about 1720 in Stegen, Luxembourg), and the great-great-grandson of Maximus Prommenschenkel (born about 1694 in Stegan, Luxembourg). The house of Michel Prommenschenkel (dated 1782) is still occupied by the Prommenschenkels in Rippig, Luxembourg. Barbara Marthaler was the daughter of Joseph J. Marthaler (born in Hymerschein, Bavaria, Germany on February 7, 1823) and Anna H. Knoeter (born in Halle, Prussia, Germany on March 7, 1820), who had a farm near Meire Grove, Minnesota. Barbara was born during the Great Sioux Uprising or Dakota Conflict (mentioned above) where the Marthalers lived at Richmond, Minnesota, which is why they fled to St. Cloud while Joseph fought in battle. The Marthalers go back a dozen generations through Leimersheim, Germany to John Peter Marthaler of Zurich, Switzerland, born in 1665, which is a published genealogy and too lengthy and redundant to recount here. Nicholas J. Bromenshenkel married Rose Dicks (born June 13, 1891 in Sauk Centre, Minnesota), and her parents were Charles Dicks and Margaret Scheiman, both of Germany. Rose A. Otte, my grandmother, was the daughter of William John Otte (born in 1885 in Melrose, Minnesota), and Frances Macke (born September 21, 1882 in Cincinnati). I have faint childhood memories of Bill and Frances Macke Otte. My grandmother Rose died in 2012 in Sauk Centre, Minnesota, at 96-years-old. William John Otte was the son of Wilhelm Otte (born March 10, 1849 in Oldenburg, Germany) and Mary Imdieke (born July 17, 1850 in Damme, Germany). Frances Macke was the daughter of Bernard Macke and Catherine Dickhaus (Ben Macke and Katy Diekhaus) of Germany (emigrated about 1888, perhaps from Damme, Germany). Bernard Macke is probably the 1851 son of Johann Bernard Macke and Catherine Adelheid Poppelman. Some of the Imdiekes and Mackes owned a dairy together in Cincinnati. Mary Imdieke is probably the daughter of John Gerhard Imdieke and Catherine Adelheid Liening, both born in 1840. I previously had the full genealogy of my children on this site, but have removed it except for one important connection, here. I am interested in a community of Texas pioneer Mormons from 1848-1856, and the possibility that my children had ancestors in this group. They are descended from Susan Jane Smithwick. Family tradition is that she was born in Texas, 1855; but census records state July 1855, in Arkansas, to parents from North Carolina and Arkansas; the confusion may originate from him being from Texas, and her living married to him in Texas at the 1880 and 1900 censuses). They married in Washington, Arkansas, September 28, 1870, when she was 15 and he was 30 and more than twice her age. Henson could be a Norwegian surname, but they had red hair like Scottish, according to the family; and Smithwick is likely an English surname. Folklore says the Smithwicks were part of Lyman Wights early colony in Texas. Family sources told me that Mr. Smithwick, of the family of Susan Jane Smithwick, was put in charge of Lyman Wights colony whenever Wight left on a mission. So it sounds like Susan Jane Smithwick was born into the Wight colony in 1855, and her son Herman H. Henson was born into the supposedly extinct Wight tradition in 1889, and his wife Surilda Jane Phelps was baptized into this tradition with his father and mother present at about age 21 when he was about age 23, three years after their marriage. 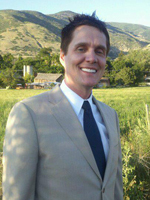 From this line my children have ancestors in the Mormons groups let by Lyman Wight, and then Joseph Smith III and Granville Hedrick. I researched this Smithwick connection, and sure enough, Noah Smithwick was a blacksmith and miller involved with Lyman Wight and the Mormon Mills settlement near Smithwick, Texas, and near Austin, Texas, in the period between 1845 and 1855. He bought the Mormon Mills from Wight in 1853. Smithwick was born in North Carolina on January 1, 1809, the state where the father of Susan Jane Smithwick was certainly born. The trouble is, there is no Susan Jane Smithwick living in the colony with Noah Smithwick in the 1860 census. In the 1850 census, 52-year-old Noah and his 51-year-old wife had children aged 9, 7, 4, and 2; and in the 1860 census they were aged 18, 15, 13, and 8 (apparently the 1850 7-year-old did not survive, and the 1860 8-year-old was new). None of them was named Susan or born between 1852 and 1860; but is plausible that he had a polygamist wife who returned to Arkansas in 1855, since he was living in a polygamist Mormon community. There is no Susan Jane Smithwick living in Arkansas in the 1860 or 1870 census, nor anyone who could plausibly be her parents. After the death of Wight in 1858, most of the Mormons had joined other Mormon groups. I am supposing that Susan Jane Smithwick eventually became a follower of Joseph Smith III. Noah Smithwick left for California in 1861 with three of the remaining five Mormon families, so it is reasonable to suppose that the Smithwicks married in with the Mormon settlement. But Susan Jane was in Arkansas getting married in 1870, not with the Smithwicks in California. Noah Smithwick wrote a book entitled, The Evolution of a State, or Recollections of Old Texas Days (Austin: 1900), in which he treats the subject of Mormon Mills and Lyman Wight. Of course, I bought a copy of the first edition of the oft reprinted piece of Texas and Mormon Americana.